You know the situation — you go to sleep and your pool water is crystal clear; you wake up and it’s green. How did it happen overnight? The truth is, when the conditions are just right, algae can bloom in the blink of an eye. Getting to the root of the problem requires you to recognize what the problem is from the onset. Here are the different types of algae and how you can solve the issue. Green algae is extremely common as it most noticeably appears right after hazy water conditions from improper filtration or sanitation. 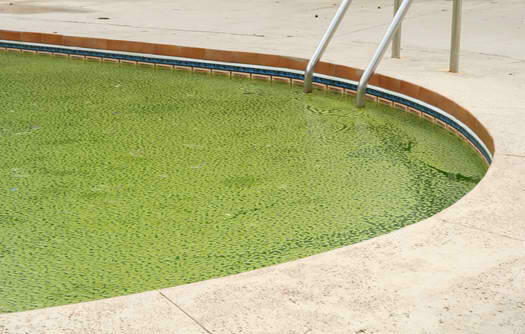 Green algae often appears in the pool as a floating substance, although it can cling to the walls and show up as sheets or spots as green slime. Yellow algae, mustard algae, commonly appears in the shady side of the pool and is a hard type of algae to get rid of. Pool owners often must fight this type of algae year-round once it appears so you can prevent reinfection. Black algae is the most difficult algae to get rid of because of the strong roots and protective layers that form over the plant. Black algae appears as a dark black or blue/green spot the size of a pencil tip and it will root itself into the grout and tile unless the roots are destroyed completely. It is extremely difficult to get rid of because the spore heads contain protective layers to keep cell-destryoing chemicals from entering the organism. The most common way to prevent algae blooms are through proper chemical balance and sanitizer residuals, and through keeping the pool relatively clean at all times by brushing it on a regular basis. Elite Pools and Spas of Houston can help you maintain your swimming pool to prevent issues of chemical imbalance and sanitation problems. If you need help with your pool cleaning, contact us today to schedule your weekly pool service.